Saying goodbye to DC, the final scene...ideas. how do we visualise DC's final scene? My idea: I want Bond and M standing on the pavement between Buckingham Palace and Green Park in the Summer. There is a basic debrief and M senses that Bond is slightly deflated or unsatisfied. "Bond, something we don't discuss or refer to. These people"
"If they could... if they knew...everything you've done. They would thank you. "Untill the next time double O seven"
"Untill the next time, M"
Bond smiles and then walks away. Zoom out as he merges in with the crowd within the park. Not a bad idea that one...I like it actually. He'd have to nip in and get the Queen to go parachuting again. 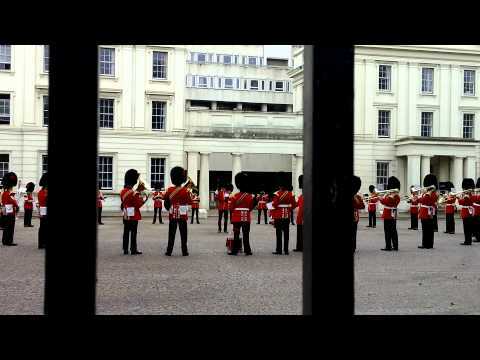 M's reference to Buck House would get the audience (as with you) thinking about that Olympics clip but it also fits in with the wider Bond references to the Queen (OHMSS and TND for example). It also places the DC era into clear historical context as sadly, our Queen's era is also drawing to a close so, in decades to come, it will be the more poignant. Someone is on form today,again,very good. Bond escapes Blofeld's castle just as it explodes but the explosion knocks him into the sea. He's bleeding out after his fight with Blofeld and is drowning, eventually he just lets go, falling unconscious. We see his funeral where Q, M, Moneypenny, Felix, Tanner, Kincade and maybe even Camille are in attendance. But then after that it cuts back to him in the sea and he's rescued by the Bond girl who helped him swim there from her island fishing village earlier. She nurses him back to health but he has amnesia. Eventually through a newspaper or something on TV he spots something that jogs his memory, it's the mention of some sort of enemy territory/nation that had also played a role in the film earlier (teaming up with Blofeld). The Bond girl is about to tell him she's pregnant when he reveals he's leaving, to find out who he is. He sets off, heading straight into the hands of his enemies blissfully unaware of how dangerous it actually is and with no recollection of his training, while all his friends and allies think he's dead. What happens next is left to our imagination. Maybe he got there, was about to be arrested and he did a Jason Bourne and all his training kicked in and he made an escape back to England. Maybe he was captured, tortured and when they realised he was of no use to them after all, executed. Maybe he spent the rest of his life in prison there. Maybe he was brainwashed, sent back to assassinate M but was able to be deprogrammed and ended up becoming 007 again. We won't ever find out for sure because that tragic ending is the last we see of DC's Bond. Or, Bond is already exhausted and injured from his fight with Blofeld. He still rigs the castle to explode and tries to escape but is pinned down when fighting his way out. He makes a last stand and kills the rest of the guards but is hit several times. He tries to push on and escape but realises there's no time. So he slumps down against a wall and relaxes, finally at peace, content with everything he's done, as the castle explodes around him. We see his funeral same as in my other idea but this time he's actually dead. Perhaps we could have a caption after the GB saying 'The guard is changing' just to hammer it home for the terminally thick in the audience? Yes, always hard with metaphors. Do you dumb down and explain them or leave then for the clever to enjoy? "Arh, changing of the Guard"
M gestures and they sit on a park bench in Green Park. The band music playing in the background (Jeruselum? too much?) as they continue the conversation. I think you might need one of them to wink to camera a la Sean in NSNA as the line is said for the truly imbecilic in the audience to get it. I want to see him settling down on a chicken farm with Madeleine. Shove Blofeld in a granulator and make chicken feed of him. Bond was already an ageing agent in Skyfall. It would make absolutely no sense to end the Craig era with Bond still working as a 00. The writers have to come up with a memorable ending, where Bond is retired, but does not feel like a copy of the end of The Dark Knight Rises. Well, that sounds like a Tom Mankiewicz idea. Didn't Bond moot that he was, in fact, going to raise chickens in one of the books to Tanner and/or Moneypenny? Fleming? I can do a search for "chicken" in the Fleming books if you really want to know. Yes, Fleming. I could of sworn he mentioned to Tanner that when he retires, he's going chicken farming. 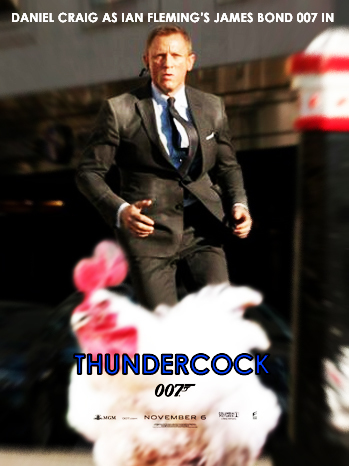 Either that or it was a really crappy dream, in which I dreamt about Bond having a conversation with Tanner about raising chickens! Yeah I think he says it when hes depressed in YOLT and is just bumbling aimlessly around the office. But that doesnt mean its a good idea. Last shot of Dan Bond should be on the boat to Vladivostok or trudging off as 'the man who is only a silhouette' please. I think you may be right old boy! He says it off hand to Goodnight? Go like before Just let Daniel Craig end his Bond drove off his Aston Martin With girl like in SPECTRE. No killing him or Quitting the Secret Service. I have a feeling it won't be any big send off or nod to his era. None of the other Bonds had that and I doubt the Craig era will be any different. To be fair only two of them knew they weren't coming back, Connery and Moore. The rest either quit after their finale movie was made or were fired. Connery's finale scene was killing Mr. Kidd and Mr. Wint and then sailing off on a cruise with Tiffany Case. Moore's final scene was getting it on with Stacy Sutton in the shower. The last scene in Fleming s TMWTGG would be proper enough. I think Daniel should be seen with a beauty and perhaps have some dialogue along the lines of: " a little soap here, a little soap there. I dropped the soap.........THAT is not the soap...........ha ha ha....OOOHH!" I posted my idea for the ending of Bond 25 in the production thread this April, and thought I'd post it here. To explain my thinking behind it, Bond just isn't the kind of character that retires to a quiet life, as that doesn't fit the kind of man he is. I am reminded of a famous quote from Andrew Jackson, who said, “I was born for a storm and a calm does not suit me.” This, for me, is Bond's life story. Destined to rush the front lines until fate comes calling. To back this up with the context of the original books, Fleming's Bond despised what he called "the soft life" and we see him perpetually craving some excitement in life when he's away from his international missions for too long a time. He's miserable in the year between Diamonds Are Forever and From Russia with Love, and that has more to do with his boredom than Tiffany leaving, as far as I'm concerned. After his brush with death in From Russia, the closest to death he'd been to that point, Bond wanted nothing more than to be sent off on something dangerous again. He's an adrenaline junkie, and needs to work. As far as the ending of SP goes, I view Bond as thinking he wants to leave, because that's what people keep telling him. In CR Vesper was talking in his ear about how he needed to keep his soul and do honest work, in SF he was the old dog that needed to get out if he wasn't sure of himself or past it, and in SP Madeleine mirrors Vesper's discussions with him about choice in a very intentional way on the train, where she mentions his ability to choose what he wants to do, to live a life where he isn't in danger and has someone to spend that life with. I think the story of Craig's Bond has been one of choice, or really, the absence of it. He allows his view of his life to be warped by the judgements of others, and doesn't seem to be able to think for himself; perhaps there's a metaphor in here somewhere, of the loyal agent who allows himself to be used, as is his nature. As a pawn, he doesn't make his own decisions. For my ending, the intention was to have Bond actively making it clear that the choice he made was his own, finding out in a revelation that he essentially was always making his own choices despite it not feeling like it. The man who has constantly been told who he is or who he should be is done listening to anyone who isn't himself and has found his own identity, comfortable in the choice he has made. Here is my basic outline of the final scene/s of Bond 25, from the ending of a climactic moment (a battle at a castle between Bond and his 00/SAS friends and Blofeld and his SPECTRE agents?) to the closing credits. M: "No word from Bond?" M: "Ring Tanner, won't you? I've had him keeping an eye." Moneypenny: "How's he, Tanner? Left his flat yet?" Tanner: "Yes, a good while ago. We've been following him from the car, but he's gone on foot the whole way and...well, you'll never guess where he's planted himself." Moneypenny: "Bond's at a cemetery, sir." M (bemused): "A cemetery? Why would he go there? His parents' graves are in Scotland, right? What other next of kin would he have around here, and why pay his respects now?" Moneypenny: "You know how he is, sir. Close to the chest and all that. (short pause) Tanner?" Tanner: "Still here. I'll keep a watch on him, let you know when he's on the move." Bond: "Tell him I'm on my way." Tanner (stammering): "Ri-right. Of course." Tanner (cluelessly pointing in the direction of the cemetery): "What was that all about?" Bond (dryly, but with perceptible truth): "Just seeing an old friend." (I imagine that, up to this point, Bond and Madeline would've been separated after a dangerous event forced Bond to keep her in hiding and in safety until his feud with Blofeld was over. The moment would be all the more impactful for their time away, especially in light of the choice Bond has made that will be hard to break to this woman who imagined more for him). Madeleine (with a sparkle in her eyes, and a great smile): "James." Madeleine (looking down): "You're going back there, aren't you?" Madeline (in full knowledge): "But we talked about this, remember?" Bond: "Yes, we did talk about it. And I listened to you. Just like I listened to another woman tell me the same thing (in reference to Vesper) during a time that feels decades removed from now. I've heard those same old platitudes recited to me twice now, of my choice to be who I want to be, that my life has more meaning than being a bullet receptacle in a job with no hazard pay." Madeleine: "And I meant those words..."
Bond: "Yes, I know you did. But they were your words, not mine. That's the whole point." Bond (attentively to start): "I'm not upset with you, please understand that. You cared enough to see my side of things, and cared even more to try and give me an honest life. I'm sure a lot of that understanding is down to your father, as you know how men like us can be. But in the same way you understood and accepted why I had lived the life I had before we crossed paths, I hope you can understand and accept the choice I've made now." Madeleine (her eyes already realizing the truth, but asking as a human formality): "Which is?" Bond: "So much talk of choice and purpose and... Well, in the end it occurred to me that maybe I have been making my own choice all along. This job has kept pulling me back, time and again, and I've allowed it to do so. Through love, death, 'retirement. '(dryly punctuating that last word) There comes a time when a man must realize his place and what the universe is trying to tell him." Madeleine: "This hard life...that is what you truly want?" Bond (honest for the first time in a long time): "I think it's what I need. The soft life would never suit me. The quiet days at home, watching the paint dry. The simple picnics in the field, the "Oh, how long has it been" anniversary dinners and the well manicured lawn in the countryside. It leaves a bad taste. It's a life I may've thought I wanted, but only because that's what everyone kept telling me I should want. But I'm a soldier, and I have a soldier's lot in life. The travel, the danger, the darting between crosshairs. It may sound mad to admit it, but I need those feelings. I can't deny my nature any more, especially when so much is abundantly clear. Anyway, all that is more preferable than the dreaded quiet and obnoxious boredom of the soft life. I was born for a storm, and a calm does not suit me, if you'll forgive the dramatics. Doing this job, and in some small way protecting people who can't protect themselves, even if they'll never know what I've done...well, I find contentment in that and I don't think I'm wrong to. It's not glamorous and it is rough, but it's all I've ever known. It's far too late to change roles now, I'm afraid, nor do I think I'd want to. No matter how tempting the offers..."
Bond: "It's why I wanted to meet you here. To set things straight and make it all clear. To allow you to live your own life now, like I have to live mine. It was wrong of me to make you think I had other intentions, as time is valuable, and, like you've told me before, it's important to live according to our own choices." Bond: "That's my choice and I'll be there until I'm no longer able to do the work, or M demotes me for reckless behavior. I don't care to think ahead when it comes to this job, and I guess that's been conditioned into me through the military and years of service. But this is assuredly my life, and I'm done questioning another purpose for it." Madeleine: "I won't say I'm happy for you, James, as you know where I stand and it doesn't feel the right way to say it. But your choice is your choice, and I must respect that." Bond (earnest and committed , but speaking with heart): "Goodbye, Madeleine." Bookending the DC era by having him visit Vesper's grave is a good idea. The metaphor is that Vesper is burried (so is that plot line) and we can move on (with a new Bond) and obviously there will be comparisons to FYEO. Not so sure about Bond breaking up with Swann. Has Bond ever broken up like that before? Could be a bit "Mills and Boon"?